A hypoallergenic treatment that does not irritate skin. Paraben and mineral oils free. With hyaluronic acid, argan oil and vitamins. Soft, delicate and oil free formula fights with 6 skin imperfections. Restores and hydrates the skin while mattifying and controlling oil production. 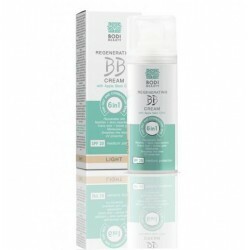 The cream creates a thin and light colorful layer on the skin which controls fatty secretion. Cream evens the skin tone and makes the skin look clean and glowing. Hides the imperfections perfectly. Small lines reduction thanks to carefully selected active ingredients. With SPF20 protects the skin from harmful UV rays. As a result of cream usage the skin is lifted, smooth and young. Apple stem cells PhytoCellTec™ ; Colla-Gain™ - the extract of pomegranate flower; Matrigenics.14 – concentrate from alga Undaria pinnatifida; Dry Flo Plus – hydrophobic modified corn starch, which absorbs sebum and guarantees long mattifying effect; UV-filters SPF20; hyaluronic acid; argan oil and vitamins. Suggested in two tones – light and medium. Apply morning with massage moves small amount of cream over the clean face and neck. Avoid eye contour area. 30 ml. airless bottle, which preserves active ingredients of the cream.